March has come, cheers! And he brought us 19-year tracks on the wing. Shall we listen? Of course! Megan Traynor, Pauline Rostov, GRIVINA, Nastya Kamensky, Alyona Apin and CHVRCHES. Here is the assorted! Listen to the collection Issue No. 42 (March 4) in high quality, absolutely free. You can listen to the whole collection, or separately song by song. In addition to Issue No. 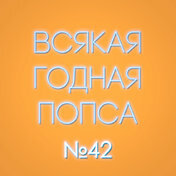 42 (March 4) of the collection, you can find any other one by following the link and get information with the already collected collections and collections of tracks, songs and music.